Go from novice to pro in search engine optimization — from keyword research and implementation to technical SEO — with online SEO training from TCF. You can pay in installments using PayPal Credit. 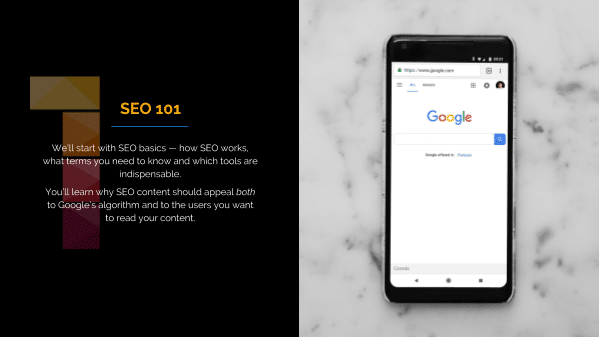 Whether you have some search engine optimization experience or you’re a complete beginner, the SEO 101 Video Training Series will provide you with the knowledge you need to turn your website into a lead-generating powerhouse. Learn how to drive the kind of highly targeted traffic ads just can’t buy, and turn that traffic into sales, in just eight hours of self-paced elearning. 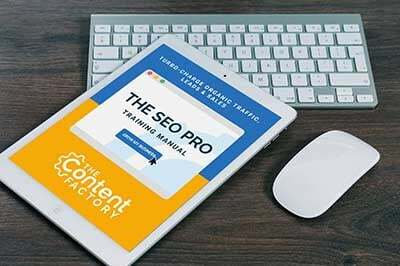 You’ll also get access to all of the internal SEO and content marketing guides and templates we use at The Content Factory, including The SEO Pro Training Manual — a comprehensive guide to organic search, from keyword research to building quality backlinks (including a list of 110 blogs that accept guest posts!). 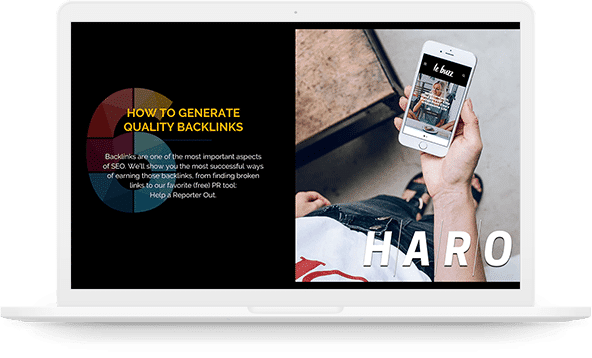 A free trial of our favorite SEO tool, which does just about everything for you – it’s like a Swiss Army knife for SEO, and we’ll teach you how to use it. How to write in a way that makes Google happy while earning more customers. The three main factors you need to consider when choosing which keywords to target, so you generate serious ROI instead of wasting time. 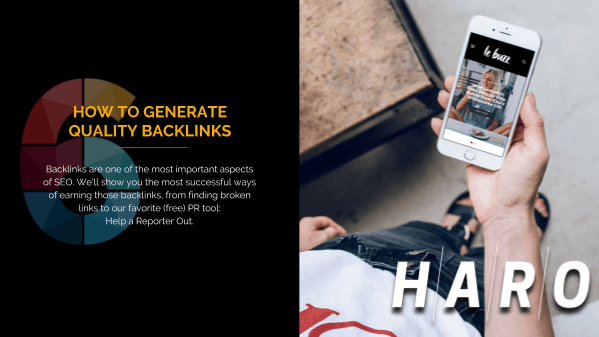 How to measure how your website stacks up against the competition, reverse-engineer your competitors’ SEO strategies and fill in the gaps to outrank them. 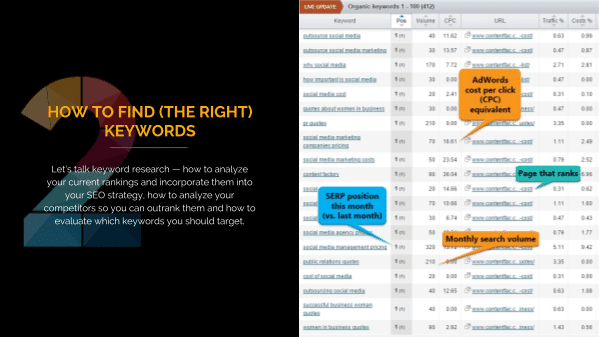 How to tell which keywords will generate traffic…and which ones will generate traffic that CONVERTS. 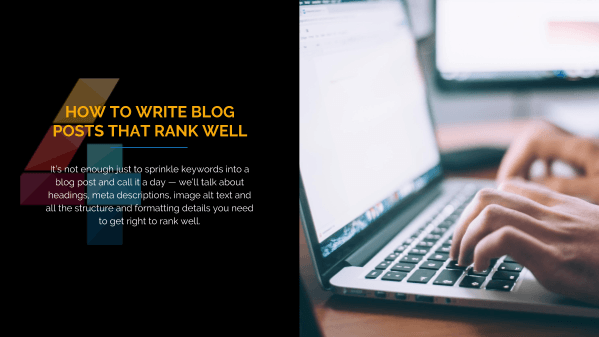 How to tell if you’ve actually got a shot at ranking #1…or even on the first search engine results page, for that matter. Why https matters (and how to implement SSL safely). As the founder and owner of The Content Factory, Kari DePhillips leverages more than a decade of experience in digital marketing and public relations to drive millions of dollars of organic traffic for TCF and its clients — ranging from internationally recognized B2C brands to B2B technology firms, and everything in between. Prior to dedicating himself full-time to search engine optimization and content marketing as TCF’s editor, Chris taught writing to college freshmen as an adjunct English professor at Rowan College at Burlington County. 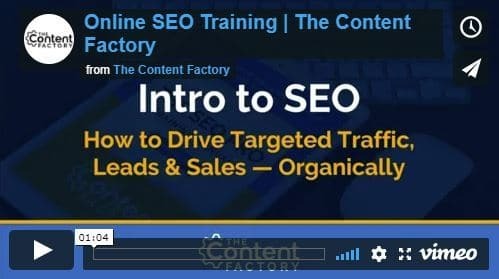 He brings this unique combination of pedagogy and SEO expertise to bear as he teaches the essentials of SEO strategy to learners of all experience levels. If you aren’t thrilled with everything you’ve learned after 30 days, simply send us an email and we’ll refund 100% of your money. The Content Factory was the answer to my question: How can I help my small business generate more business online? 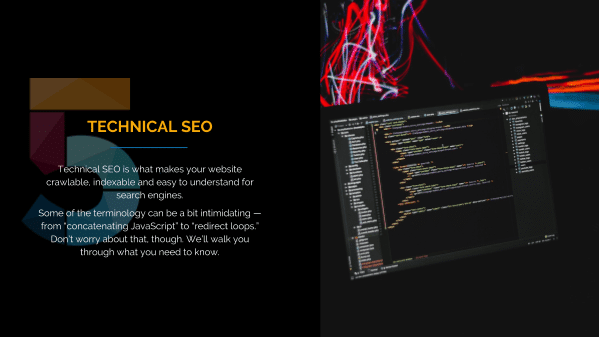 I had been looking for knowledge about SEO for months, and everywhere I looked the information felt like a foreign language. Kari and her team not only taught my marketing department the necessary tools we’ve been missing, but presented it in a way that everyone (of all different learning levels) was able to understand it. After purchasing TCF’s (very affordable) SEO Training Courses, I feel confident that my company is more prepared to expand on the web. But more importantly, I feel that we’ve finally learned the skills that will actually allow us to be competitive in our industry. My favorite part about the experience was how Kari and TCF took the time to answer my emails and questions. The personal care and attention I received was such a breath of fresh air! Normally companies will take your money and leave you high and dry, but not TCF. They actually took the time to make sure that ALL of my questions were answered- and thoroughly. I would highly recommend working with The Content Factory. I know I will continue to take part in their courses and take advantage of their unique offers and skills. These are good people who just so happen to be experts in a field that is crucial, complicated, and always changing. I can honestly say that because of TCF, I feel more confident in what I’m doing for my company online, and as SEO changes, I know TCF will be there for me. I am eternally grateful! Thank you! This course is amazing! I had high expectations of it based on the description, and it does not disappoint at all. I already have a fair amount of experience in SEO so I thought I’d know most of the material already, yet I was blown away! 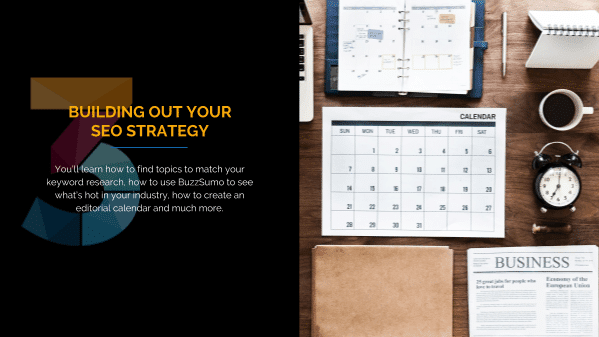 The material is presented in a clear and organised way, giving me a strong understanding of the concepts behind SEO – plenty of the ‘what we do’ but also the ‘why we do it’, which will help me with crafting my own SEO strategies. Kari or Chris actually share their screens and walk you through how to use SEMrush and more very effectively. I love how the course is suitable for total beginners and also people with prior knowledge.